Building a historical epic is better in vast sweeps, not specific hexes. I’ve always been intrigued by strategy games that seek to capture the entire scope of recorded history. Utilizing well-known historical tropes, peoples, and places to craft alternate histories, they’ve got a kind of relatability that’s hard to beat. Through the Ages is perhaps the most beloved board game in this genre. Its clever ‘use it or lose it’ resource management forces hard choices, its randomized tech timeline makes each game different, and its slowly increasing variety of action puts other games to shame. 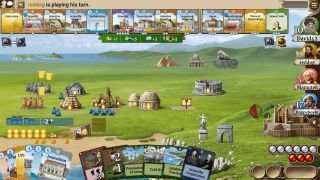 Through the Ages is often panned for its length, complexity, and the lack of interactivity between competitors, but it’s an interesting enough game that it warranted an update from creator Vlaada Chvátil in 2015 and happily remains in the top 10 games on industry bellwether BoardGameGeek a decade after its publication. It also holds my interest years after I’ve grown bored of games of the same stripe on PC, though I’ve only had the chance to play it a couple times. 4X games really fell out of favor for me with the release of Civilization 6. Each game, I researched many of the same techs, moved the same units, utilized the same strategies—if in different victory fields—and built the same patterns of buildings. It didn’t do enough to shake me out of the rut it allowed me to play in, letting me go through the motions the same way in each game. The staid, static tech tree and mindless expansion no longer appealed. I was reminded of the love I once had for the genre when the digital version of Through the Ages: A New Story of Civilization released on Steam last month. I remembered playing the board game fondly, if through a haze of sleepless convention thought, and gave it a shot. What I found was a reminder of why I love the civilization-building genre—and an oddly refreshing take on it for a 12-year-old base design. Videogame civilization-builders could stand to see where tabletop games have long broken away from genre conventions we take for granted. Civilization and its ilk tie you to specific places, placements, and arrangements. They force you to consider a large strategic map, the shifting of units, and the precise placement cities or farms. It turns out I’m not very interested in that, at least not in this genre. I’d rather see the engine of my people at work, the basic ideas that drive them, and the specific technological developments that affect my empire—not a menu of tech that anyone can choose from. I’d rather abstract my military engagements into cause and effect, dealing with consequences rather than managing a wargame clumsily layered over a city builder. Each turn in Through the Ages, you must develop your civilization with a limited handful of actions. These actions are simple: Acquire a new technology, develop a previously acquired technology, develop your population, or build a new institution—like a mine or farm or opera. As you play, cards representing technologies and leaders, events and armies, come rolling down a single technological queue. Each turn some unchosen technologies go away forever and new ones emerge. In a game with a large number of players, that means technologies will occasionally emerge and vanish before you have a chance to buy them. You’re also using the same actions you’d use to get cards in order to do basic things like increase your population or implement technologies already acquired. Through the Ages uses these limited choices and opportunities to focus on grand sweeping movements in society, rather than a hex-by-hex view. You make hard choices—does my civilization forego riflemen in favor of architecture? Do I choose democracy, or do I choose Bill Gates? Choosing one technology over another is so much more meaningful than in games with a fixed tech tree. Each game forces you to deal with what opportunities chance serves you—you can’t have anything like a reliable build order or set strategy. Relying on Irrigation, for example, to come up simply can’t be done—the chance to grab it might come and go when it’s not your turn. Likewise, managing your population is much more interesting a conundrum. You must produce food to feed and grow population, but you employ them in much more abstract occupations—assigning them in broad sweeps to mining, farming, or various cultural pursuits. A smaller population might be preferable one game, where you have access to advanced institutions, while a large one using technologically inferior buildings might be best in another. The digital edition really allows the game to shine. A game takes two hours, rather than five. The reduced turn times really make the interlocking system: You can see how combos allowing military buildup precede a war, how cost-reducing technologies deployed at the right time allow sudden growth spurts, and how Genghis Khan is still one of the nastiest customers in all of history. If you’re tired of the PC civ-builder you might want to take a look, too.